All images are by the wonderful Shelley Hartman. All the doubts and questions flood your mind. “Are they the right one for me? How do I know this is the right decision? Are they going to break my heart? Are they going to be “the one?” Will this turn out to be a huge failure? Or will this be one of the best decisions of my life?” Every question is valid. Why? Because we are dealing with your heart here. We are dealing with the most fragile, complex, and beautiful part of who you are. Opening up is always scary. It’s a vulnerable place to be in, and so naturally uncertainty will be present… and it should be welcomed because your heart deserves to be protected. When I met my husband, I was entirely, wholeheartedly, completely skeptical. I was flattered by his confidence and obvious infatuation with me, but I wasn’t sure if I could return the feelings. After a previous relationship left me in ruins, I was guarded, uncertain, and very closed off to the idea of a new relationship. Heart break will teach you to protect yourself - a valuable lesson I wish I learned earlier in life. We should never allow heartbreak to control our lives and cause us to be closed-off to all relationships, but we should learn from heartbreak. Your heart is valuable, and not everyone deserves to see what’s inside it. Although I was guarded, I knew exactly what I wanted in a relationship. From a very young age, my dad encouraged me to write out my non-negotiable’s for my husband. He asked me “who do you envision yourself with, and what are they like? What would it take for you to say yes to marrying someone? What characteristics do they need to embody?” So, I created a list, and I still have it to this day. It morphed and changed over time, but for the most part, it remained the same. When I look at that list, I can confidently say that my husband meets all of my non-negotiable’s. What’s my point? If you go into a relationship knowing exactly what you want, what you don’t want, and what you aren’t willing to compromise on, then you’ve set a strong foundation for success. 1| The ability to be selfless because girl, no love story is complete without a compromise here and there. Relationships require sacrifice. They require that you enter into any disagreement with a selfless attitude ready to listen, compromise, and put the other person first. When you enter into a relationship, you are saying yes to prioritizing the other person, and they should also be saying yes to prioritizing you. If you entertain a relationship with someone who will not put you first, you will end up super unhappy. Choose to embody a selfless attitude, and find someone who will do the same for you! 2| A great sense of humor that makes your face hurt from crying laughter. Life is full of ups, downs, success, failure, excitement, disappointment and so much more. Whoever is along the ride with you should be able to make you laugh because life is too short not to appreciate it along the way! Invest in a relationship that is life-giving, fun, and funny. Don’t entertain a relationship that drains the life out of you, makes you sad, or makes you feel like you aren’t enough. Invest in someone who not only treats you like gold but makes your heart excited and gets you laughing. It will set the tone for the rest of your relationship! 3| A kind heart that is always willing to extend grace your way. Kindness is one of the most important traits you should look for in your significant other. Why? Because a kind heart will most likely embody other great character traits. Someone who is quick to extend kindness to those around them, will treat you like the treasure that you truly are! Before entering into that relationship, evaluate that person’s tendency to be kind to the cashier at the grocery store, the stranger in the gym, or heck even to your little sister. A kind heart will put you first and always seek to be gracious in your shortcomings. 4| The ability to be patient when you’re having one of those cuddle up on the couch in sweat pants, with tears in your eyes, and a bar of chocolate in hand days. Life isn’t perfect, and you aren’t perfect. Circumstances aren’t always happy, and you aren’t always going to be happy. This is why it’s so important to be with someone who is not only patient with you but patient with life. Nobody has it together all the time, and some days you aren’t going to have the energy to be the patient one. So, your partner needs to embody patience… because you deserve to be understood, served, and comforted even in your ugliest of moments. 5| Persistence because a life-long relationship requires constant pursuing, cultivation, and acceptance. If your ultimate goal is to invest in a relationship that lasts, then you want your significant other to be persistent. 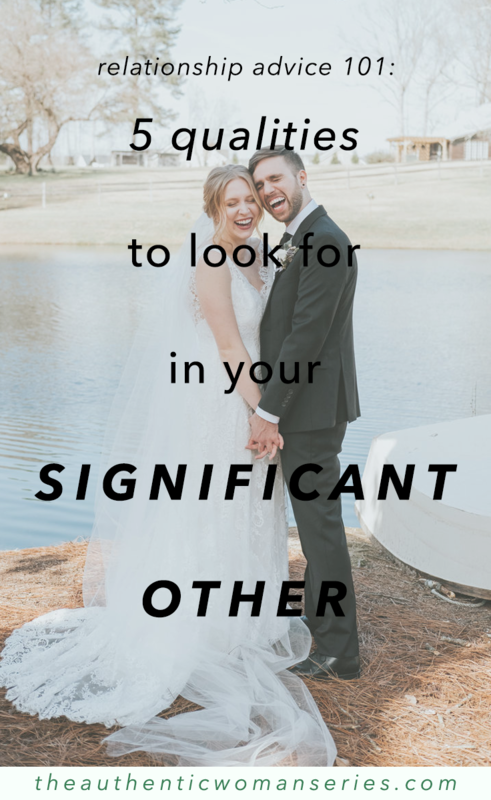 In relationships, especially in marriage, it’s very important that each person constantly pursues the other. Just because you put a title on your relationship doesn’t mean that you get to call it quits and hang up the towel. No, each person has to persistently pursue and serve one another. Go on dates, seek to understand each other, serve one another, surprise each other, and cultivate the relationship. You never reach a finish line with relationships. It is a constant journey. Take the time to search your heart and decide what your non-negotiable’s are in a relationship. Put yourself first, protect your heart, and only invite people in that embody those traits. Your heart is worth protecting, my dear. What’s one quality you look for in another person? Share with us below!